Reschedule or reassign meetings straight from your calendar invite. The new assignments will be reflected directly in Salesforce. If you or your customer needs to change the time of the meeting, it's best you reschedule your meeting either via the meeting reschedule link within meeting templates or directly in Google/Outlook calendar. Learn more about configuring Reschedule URL. You will need to have the Google Chrome Extension installed in order for the buttons to appear in Google Calendar. 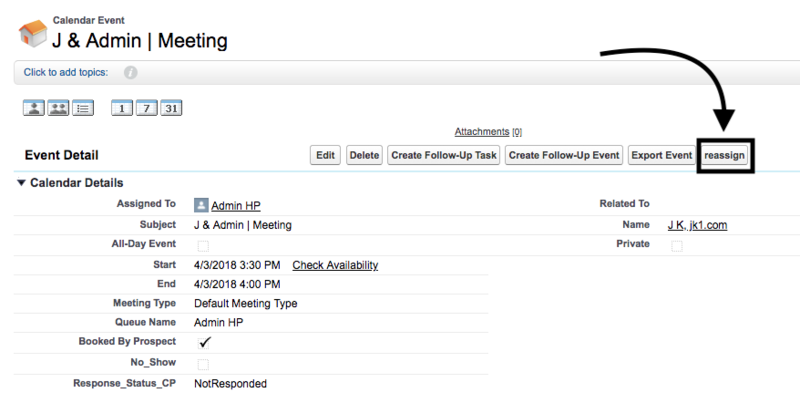 To reassign a meeting to another rep directly from Salesforce, click the "Reassign" button in the Salesforce Event. Learn how to configure Reassign Button in Salesforce. Select the correct queue, then select the rep you’d like to reassign the meeting to. Once reassignments are enabled in preferences, you will see a Reassign button at the top right corner of each calendar invite. Once reassignments are enabled in preferences and if you are using Office365 via your browser, you will see the Chili Piper button at the top right corner of each calendar invite. Once reassignments are enabled in preferences, you will see the Chili Piper "Reassign" button in your Outlook toolbar. If the same teammate is not available, the software will recommend best person to be assigned to the meeting. As best practice, reassignment should only be done within the same queue in which the meeting was originally booked.